Last time, we talked about how Emergency Managers can contact vulnerable populations–for instance, the homeless–with evacuation notices. We discovered that social connections which make communities more resilient as a whole make the homeless in those communities more resilient too. But as an Emergency Manager, I know that resilience often depends on the effects of long-term, complex social issues. For instance, Haiti sometimes finds it more difficult to recover from earthquakes than it’s sister country, the Dominican Republic, because Haiti is poorer, has non-resilient infrastructure, and social policies which (debatably) prevent economic recovery. Similarly, in America, policy discussions centering around social-political issues like homelessness impact the long-term resilience of a community to disasters. Policy discussions are important and they rely heavily on statistics. As you know, fair representation in a community means being accurately counted. How can policy makers and advocates make decisions about policy and funding without a careful understanding of the demographics and size of a vulnerable population? As you might imagine, counting a scattered and mobile population is extremely difficult. This article from the Seattle Times demonstrates how parsing the census data can greatly change the picture; depending on how you ask the question, Seattle has between the third and sixth most homeless in America. So how do you count the homeless population in your town? In America, most cities choose to do an annual, night census of the homeless to get a sample. Counting the unhoused once a year to get a sample. Most cities have an annual, nightly census where volunteers physically visit known homelessness sites and gather demographic data from those sleeping outside. Sometimes this is accompanied by census data gathered from people using homelessness services. This method of data collection can be problematic for several reasons. a) A yearly census may have data gaps. While it’s true a yearly census is good for trends over time, it gives only one snapshot of the homelessness situation on this night. Some argue that more frequent censuses would give granularity to the data. b) Each jurisdiction and agency draw the geography differently. As the Seattle Time’s points out, because of the hodgepodge way each locale accesses funding, each city and county may count people differently. “New York City, for example, counts the homeless people inside its city limits while L.A. counts everyone in L.A. County except the cities of Pasadena, Glendale and Long Beach…. 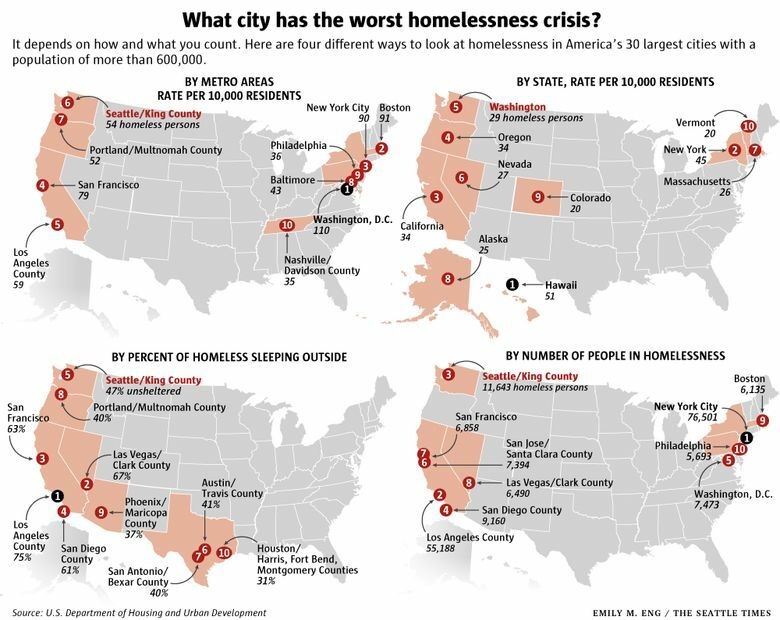 Denver and Boulder group together and count all the homeless people in the six counties around them….” This can make comparing data nationally–or even regionally–a headache. c) It doesn’t count those in shelters (sometimes, depending where you are). This isn’t necessarily a problem depending on what you want the census to tell you. Some cities, like New York are under legal mandate to house their homeless, so counting those strictly on the streets matters to them. But maybe your city wants to know more about how many people might need a certain governmental service. In that case, this statistic might not help you, beware. d) It doesn’t count the “concealed homeless”–those living on a friend’s couch or in their cars. Like point c, this is a matter of semantics; neither good nor bad, but worth noting. Is crowdsourcing better? No matter what you do, it’s hard to get a clear estimation of “hidden” individuals. Cities are big and individuals are small. Crowdsourcing has helped gather data on large, complex problems before, maybe–the thinking goes–it can do the same here. On the other hand, a competing app in New York named “WeShelter” has a gentler image. App-users “unlock” donations from sponsors which are given to several of New York’s homelessness organizations. Users have an opportunity to share their location with the app by clicking “I’m near a person who is homeless” and can also provide other information like whether or not the person needs non-emergency assistance. This is an interesting combination of location data gathering with activism. And there are many, many more apps with various methodologies out there. Homelessness census data–like most statistics–are complex and variable. However, policy makers and municipalities rely on this data to distribute funding and reassess their policies. It’s up to us to make our statistics as robust and meaningful as possible in order to support that work. Often, that means gathering different kinds and sources of data to create a mosaic-like picture of the situation, and experimenting with data gathering methodologies. A list of apps for helping the homeless. And another list of apps for the homeless. A [scholarly] history of the Census Bureau’s attempts at fair homelessness representation. Butte Countywide 2017 Homeless Point in Time Census and Survey Report. [governmental report]. A readable model of using lots of sources of data to get a clearer picture. Results of One Night Counts, a sampling.